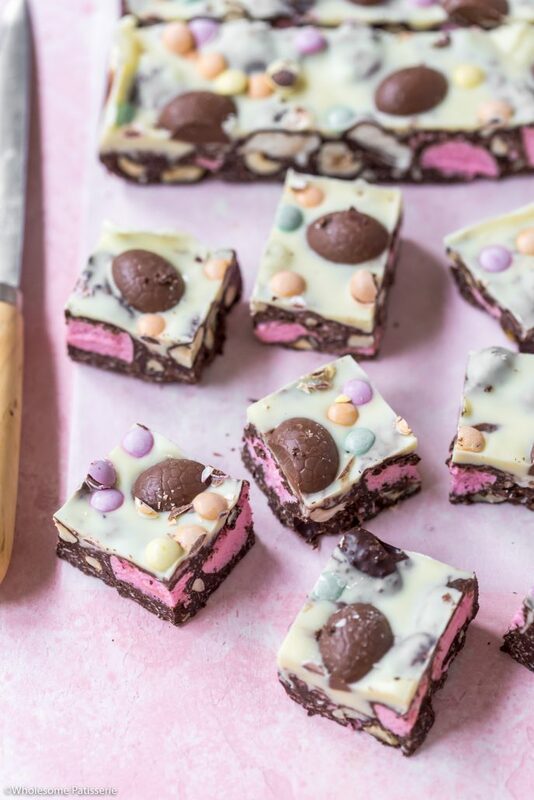 Kicking off Easter with this delightful homemade Rocky Road. 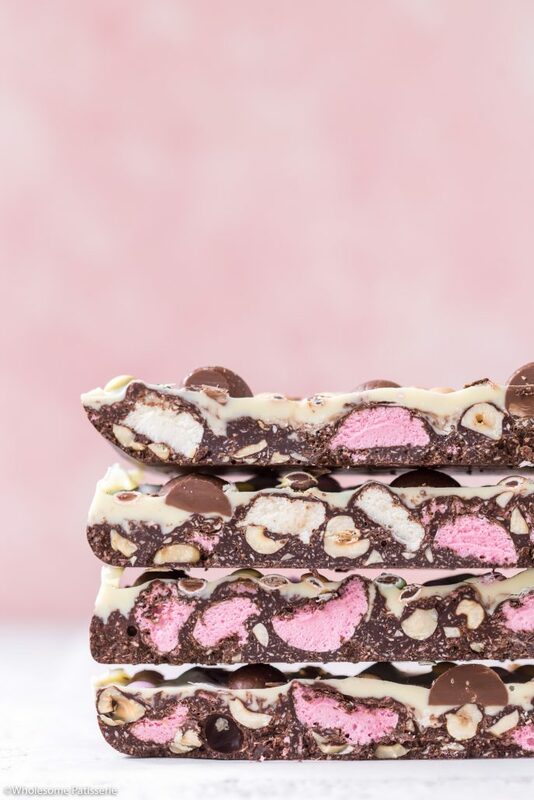 Created with the classics of chocolate, coconut, nuts, marshmallows and a twist! 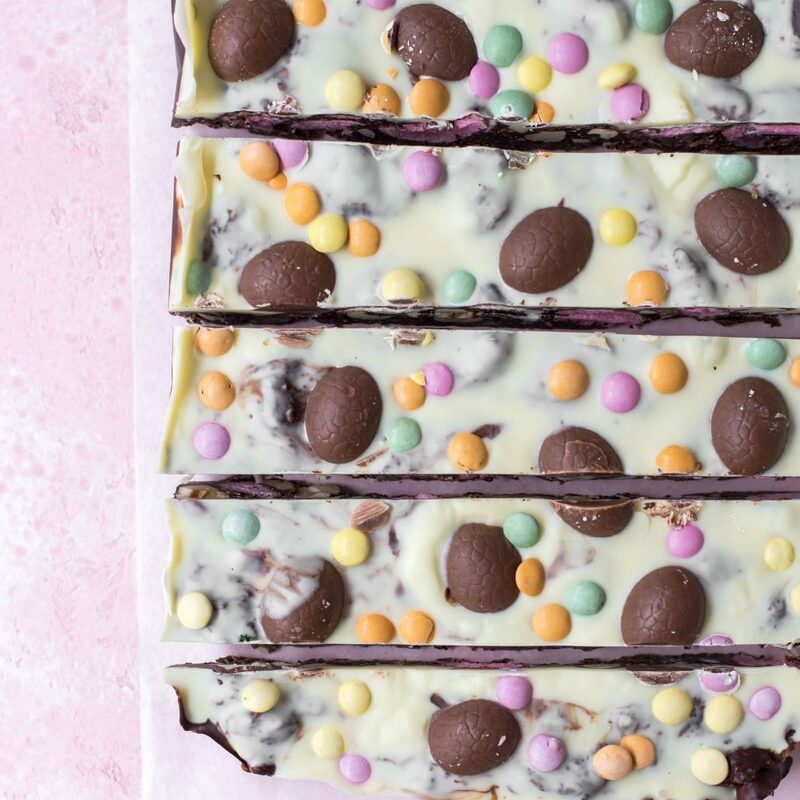 An extra top layer of goodness from melted white chocolate, mini milk chocolate solid Easter eggs and little gems. Little Gems are those cute colourful buttons you see scatted over the top. 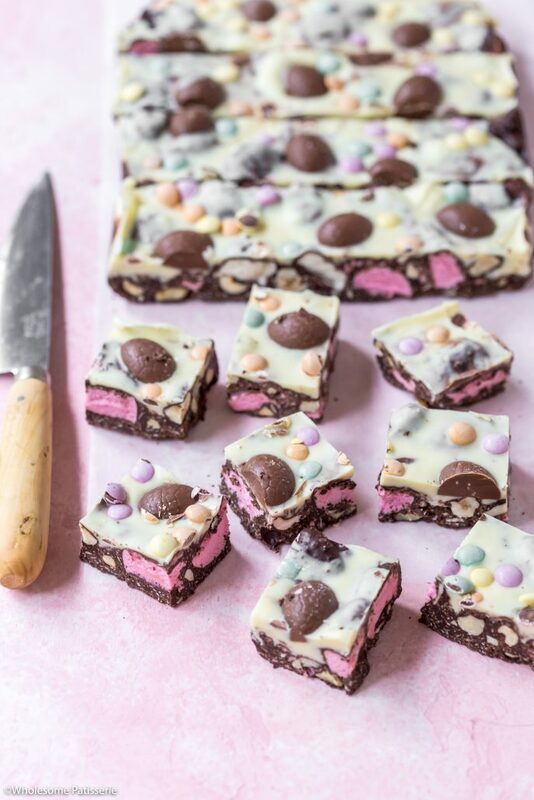 Organic Times have created Little Gems to be a healthier alternative to smarties and they’re perfect for your Easter. 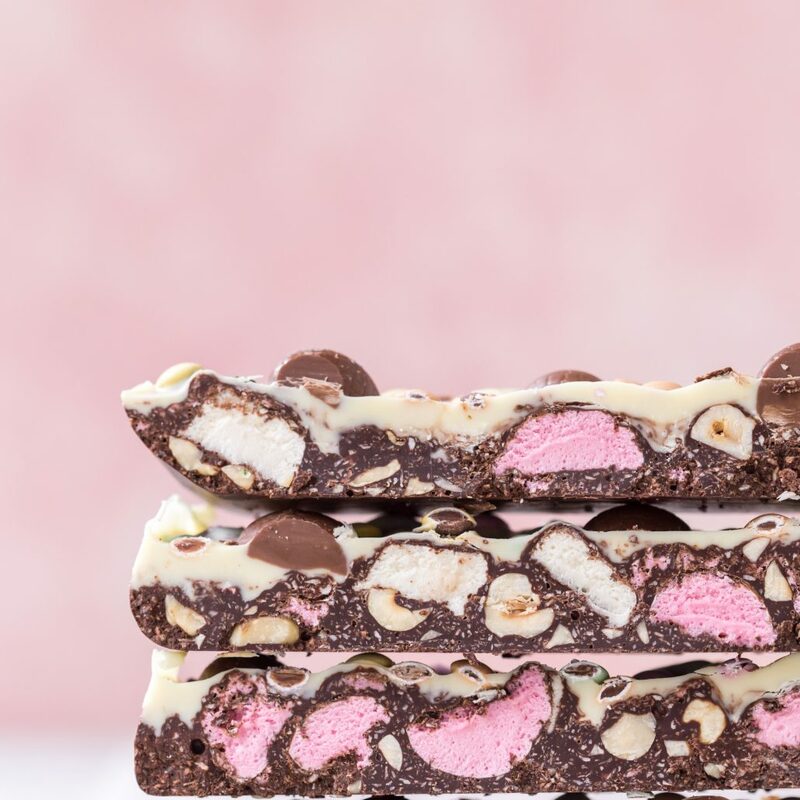 You may be thinking “this rocky road looks way too sweet for me” fear not friend, if you follow in my foot steps and use 75% or over dark chocolate for your base, it balances everything out. 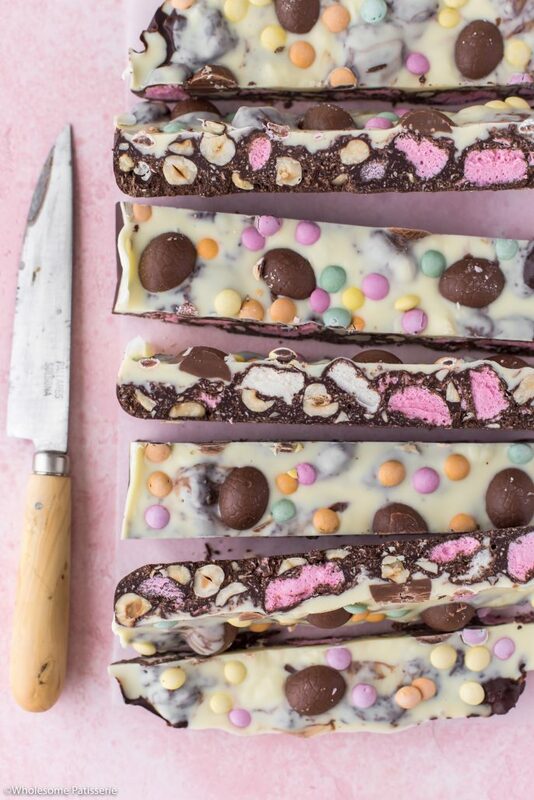 The darker the chocolate, the more bitter it becomes, therefore serving us with an ideal double layered rocky road that’s not too sweet, yay! 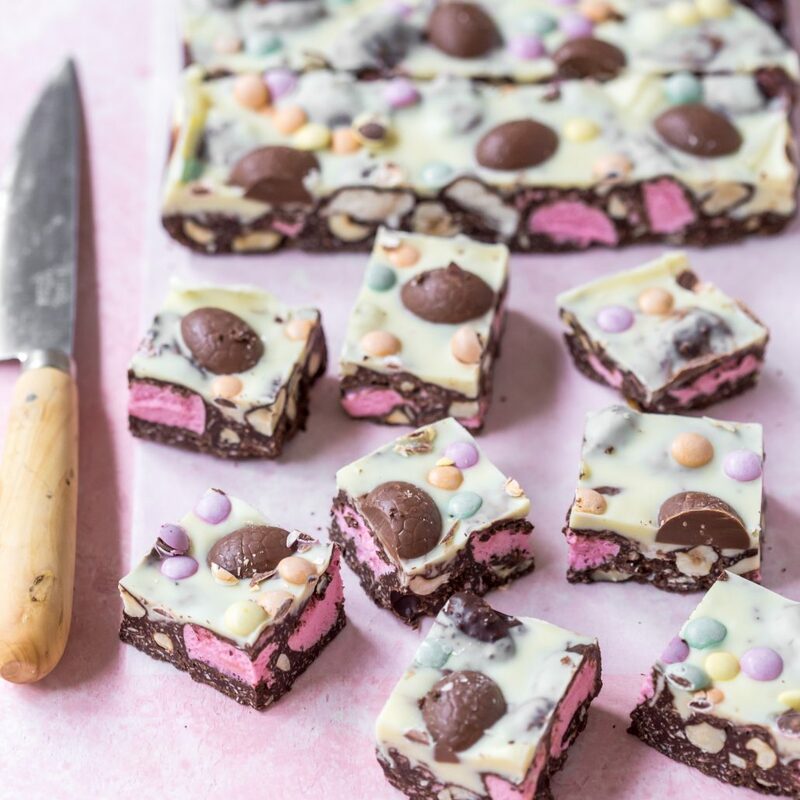 Fun for all ages and great for everyone to get involved in making the Easter rocky road, I hope you enjoy! Once chocolate is completely melted and smooth, reduce heat to low and stir through coconut. Add halved marshmallows and mix until coated in chocolate, remove from heat. Carefully pour into lined pan, spreading out evenly. Refrigerate for 15-20 minutes whilst you make the topping. Add white chocolate and coconut oil to the bowl and gently melt, stirring occasionally. Once chocolate is completely melted and smooth, remove from heat. 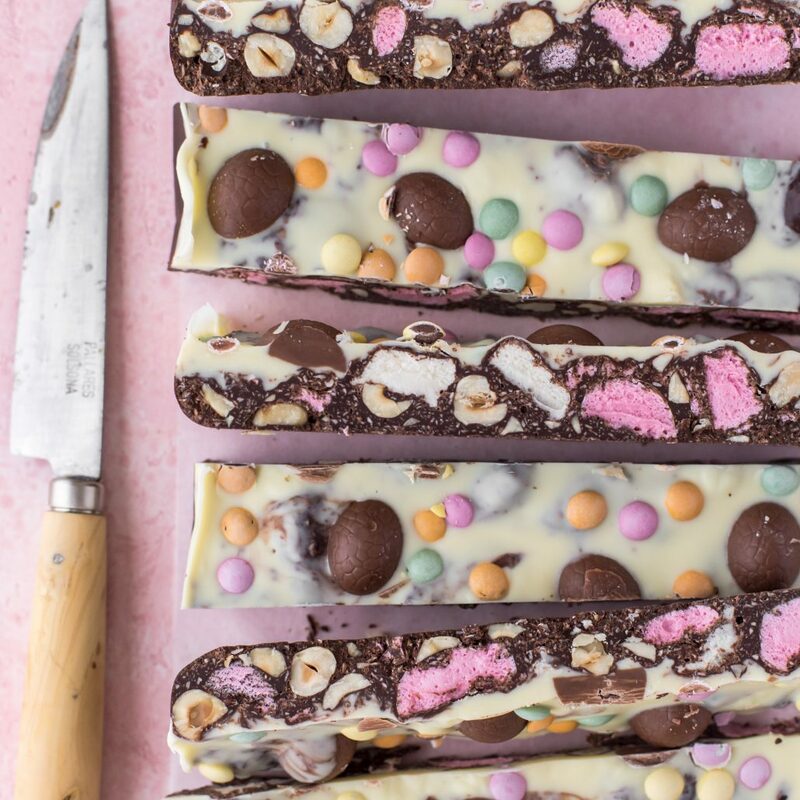 Remove rocky road base when it’s just beginning to set around the edges, the majority of it still needs to be soft but not completely liquid. Carefully pour melted white chocolate over dark chocolate base, working quickly, swirl the pan around to spread the white chocolate to an even layer. 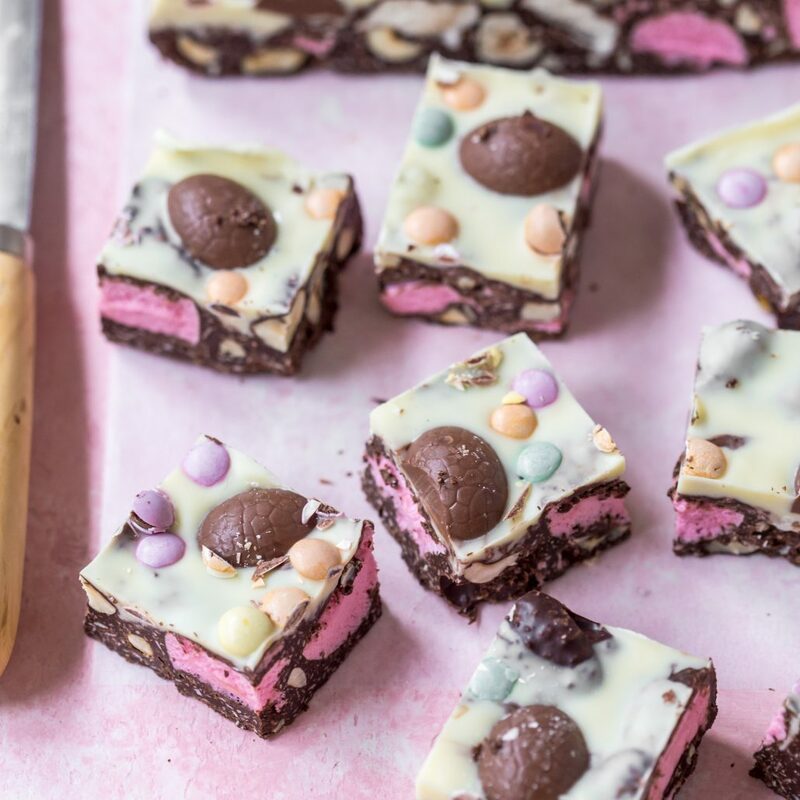 Unwrap and gently slice in half lengthways, the mini chocolate eggs. 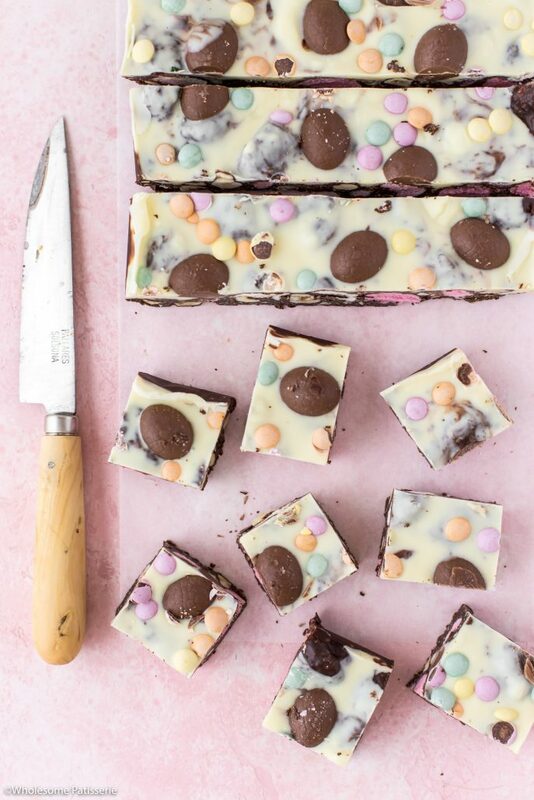 Place eggs into white chocolate topping. 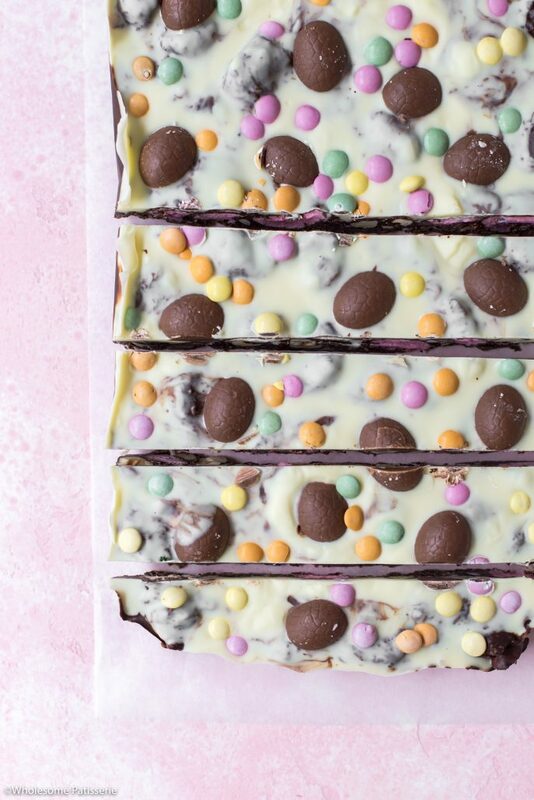 Sprinkle over little gems or smarties if using. Refrigerate for 2-3 hours or until completely hardened and set. 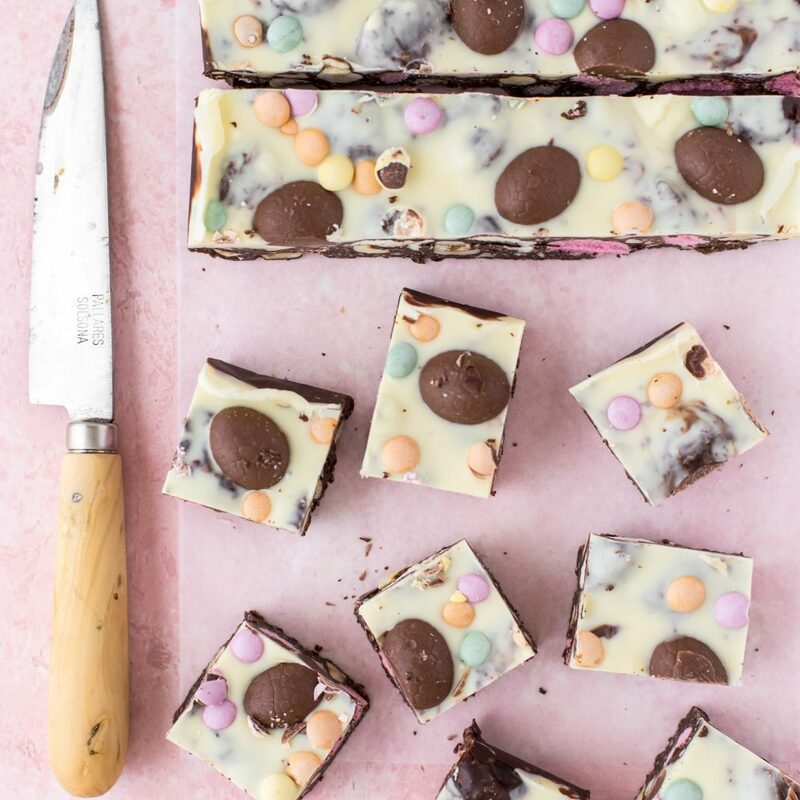 Remove from pan and slice into bars or squares. *Find Organic Times Little Gems from health food stores in Australia or on their website.